Do you remember the cheesy games we used to have to play? Those ice breakers at camp, corporate retreats, training sessions? Those adult questions that were little more than “what I did on my summer vacation” but which were meant to share something most people wouldn’t know about you? Well, I have a secret most of you don’t know. Always have. When I was five, I drifted away from Mom at the San Diego Zoo. The gibbons were over-gibboning. I didn’t like it. I wandered off. When Mom discovered I was missing, she knew where to find me. The snake house. Yup, there I was, staring at an emerald-green boa, the prettiest snake I’d ever seen. So, when I began writing, I knew I’d have to write about snakes. I haven’t found a place for them in the Mad Max series, except to explain, in Max 3, why so many doctors and nurses at a New Mexico hospital carried guns. Rattlesnakes. The serial killer didn’t use deadly toxins. Couldn’t have a snake suddenly slither in. When I started writing about a family living on the high desert of Southern California, the setting was ripe for a rattler. Here’s the setup. Toad is around ten or eleven; his younger brother, Cricket, is about seven. Killing a rattler is a rite of passage, one Toad had experienced but one that Cricket desperately wanted. He had to kill a snake to keep up with his brother. “I gotta pee before I do anything else.” Cricket jumped off the platform and tripped on an untied shoelace. He landed hard. Momentarily winded, he rolled over in the sand before sitting up to check the damage he’d done to an elbow. He heard buzzing before he saw the snake. “I won’t.” Cricket froze, eyes on the rattler, which had coiled in warning. He didn’t blink for fear the snake would strike. Ranger ran down the three steps to the sand and barked. The snake raised its rattles, head following the dog’s movement, tongue tasting the air. While the boys were arguing, the snake left off sunning itself and rattled a final warning, before it uncoiled and slithered off. “It’s getting away” Cricket shouted. Cricket pinned the snake with the fork right behind the triangular head, exactly like Pops had taught him. Toad handed him the machete. His brother swung the sharp knife and severed the head with a single chop. It flew a few feet away from the body, poison dripping from its fangs. Ranger retreated to the safety of the platform and barked encouragement. Both boys watched the snake’s body whip back and forth before the convulsions slowed to a stop. Toad walked around Cricket and kicked the head aside. Cricket ran toward the outhouse. “Now, I really gotta pee. Don’t you do anything with the snake. I get to cut the rattles off.” When he was back, he collected his trophy. The boys skinned the snake before burying it, head and all. They nailed the skin next to a dozen others on the back of Shorty’s run-in shed. When the boys’ parents got home a couple of hours later, Cricket crowed about what he’d done. And so Cricket takes one step toward adulthood. Not much of a step, but movement nonetheless. BTW, I killed my first rattler when I was little older than the fictional Cricket. I kept my rattles for decades in my treasure box. One day, it vanished. I don’t miss it, but if I saw another rattler, I’d have no problem dispatching it. You’re probably wondering why I have pictures of actors who’ve played police or sheriffs as the header here. Simple, really. I want to give a shout out to police who have recently taken time to help me get details right. But first, a seque down memory lane. When I was a small child living in suburban Los Angeles, I was taught that policemen were my friends. If I needed anything, I could walk up to one and ask. That said, I realize growing up white in the ‘burbs, not a minority in an inner city or the ghetto or the ‘hood, have shaded belief in the police. Can’t help it. That’s the way I was raised. Over the years, I have been arrested and tossed in the slammer more than once. But, that is the subject of another post. Maybe. When police officers began playing secondary roles in my books. I needed primary research. 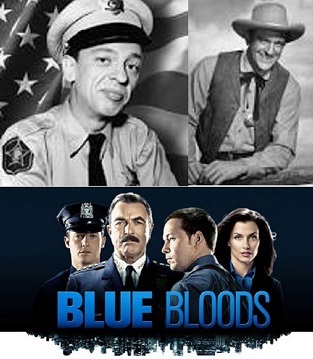 Sure, growing up with Matt Dillon in Gunsmoke or Barney Fife in The Andy Griffith Show or today’s Blue Bloods gave me a distorted view of what a policeman’s life is today. To those men and women I pestered in line at Starbucks, thank you for telling me how much your belt weighs. Thanks to the policeman directing traffic at Saratoga Race track for telling me how much is bullet-proof vest weighed and how hot it was in August. Thanks also to the Maryland State Deputy who let me hold his Taser. I’ll never reveal his name, and I’ll never forget how the weapon felt in my hand. To the police information officers in rural Mississippi, you were an invaluable source of deep background on what life was like in post-Katrina Mississippi. And to the State Police public information officer who not only answered my questions about jurisdiction at the same time and place, but who invited me to call back with any more questions, I hope I have the facts right in Uncharted Territory. You gave me more information than I could use. I will never forget your kindness. And to agents from the FBI, CDC, and DEA, as well as the Secret Service, for helping me understand jurisdictions once again, you have my sincere gratitude. These men and women are my heroes. They do their jobs every day, most with no fanfare. So I’m whipping out my trumpet and blowing a salute to you. Mom was right. If you need help, ask a cop. Have you had positive interactions with police officers?